Trump's Pick For Ambassador To Israel: 'End The 2-State Narrative' : The Two-Way Bankruptcy lawyer David Friedman is a longtime supporter of Jewish settlements in the Israeli-occupied West Bank and has questioned the need for a Palestinian state. 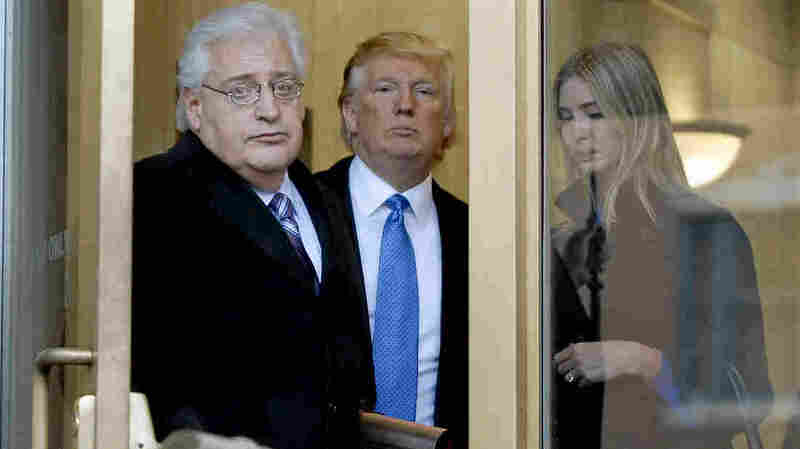 Attorney David Friedman (left) exits U.S. Bankruptcy Court in Camden, N.J., with Donald Trump and Trump's daughter Ivanka in a 2010 case involving Atlantic City casinos. The president-elect plans to nominate Friedman as U.S. ambassador to Israel. According to the Israeli newspaper Ha'aretz, Friedman is an Orthodox Jew who maintains a part-time residence in Israel. He is a regular columnist for the Israeli news website Arutz Sheva, which is identified with the settler movement. In his columns, Friedman has called the two-state solution an "illusion," and compared liberal American Jews to "kapos," Jews who aided Nazis during the Holocaust. "I intend to work tirelessly to strengthen the unbreakable bond between our two countries and advance the cause of peace within the region, and look forward to doing this from the U.S. embassy in Israel's eternal capital, Jerusalem." The U.S. position has long been that the legal status of Jerusalem is yet to be determined. A law passed by Congress in 1995 requires the U.S. to move its embassy to Jerusalem but allows presidents to waive that requirement, which all have done. During his campaign, Trump pledged to move the embassy. Friedman's nomination was greeted by a storm of commentary — pro and con. Arutz Sheva quoted settler leader Yossi Dagan: "David Friedman is a friend and a true partner of Israel and the settlements." "[Friedman] has the potential to be the greatest U.S. Ambassador to Israel ever. No previous ambassador appreciates the political, historic, legal and religious rights of the Jews to Judea, Samaria and Jerusalem like David. Yet he respects and understands the beliefs and hopes and dreams of the political left in Israel and America." "[Friedman] represents extreme fringe views that are appalling to most American Jews. Those of us concerned about Israel and the cause of peace there should be alarmed that Mr. Friedman will be representing America's interests." "The position [Friedman] advocates is more extreme than any government of Israel has stated. We have serious concerns about someone who says annexing the West Bank to Israel is a viable way to preserve Israel's Jewish and democratic essence." Friedman must be confirmed by the Senate. Several left-wing U.S. Jewish groups — among them Americans for Peace Now and J-Street — say they will work to defeat his nomination.